University of Otago researchers have discovered that raw fruit and vegetables may be better for your mental health than cooked, canned and processed fruit and vegetables. Dr. Tamlin Conner, Psychology Senior Lecturer and lead author, says public health campaigns have historically focused on aspects of quantity for the consumption of fruit and vegetables - such as five or more a day. However, the study, recently published in Frontiers in Psychology, found that for mental health in particular, it may also be important to consider the ways in which produce is prepared and consumed. The top 10 raw foods related to better mental health are carrots, bananas, apples, dark leafy greens such as spinach, grapefruit, lettuce, citrus fruits, fresh berries, cucumber, and kiwifruit. "Our research has highlighted that the consumption of fruits and vegetables in their 'unmodified' state is more strongly associated with better mental health compared to cooked/canned/processed fruit and vegetables," Conner says. This could be because the cooking and processing of fruit and vegetables has the potential to diminish nutrient levels. "This likely limits the delivery of nutrients that are essential for optimal emotional functioning," she said. For the study, more than 400 young adults from New Zealand and the United States aged 18 to 25 were surveyed. This age group was chosen as young adults typically have the lowest fruit and vegetable consumption of all age groups and are at high risk for mental health disorders. The group's typical consumption of raw versus cooked and processed fruits and vegetables were assessed, alongside their negative and positive mental health, and lifestyle and demographic variables that could affect the association between fruit and vegetable intake and mental health - such as exercise, sleep, unhealthy diet, chronic health conditions, socioeconomic status, ethnicity, and gender. "Controlling for the covariates, raw fruit and vegetable consumption predicted lower levels of mental illness symptomology, such as depression, and improved levels of psychological wellbeing including positive mood, life satisfaction and flourishing, Conner added. These mental health benefits were significantly reduced for cooked, canned, and processed fruits and vegetables. This research is increasingly vital as lifestyle approaches such as dietary change may provide an accessible, safe, and adjuvant approach to improving mental health." A fruit and vegetable intake above five-a-day shows major benefits in reducing the chance of heart attack, stroke, cancer and early death. This is the finding of research, led by scientists from Imperial College London, which analyzed 95 studies on fruit and vegetable intake. The team found that although even the recommended five portions of fruit and vegetables a day reduced disease risk, the greatest benefit came from eating 800 grams a day - roughly equivalent to 10 portions - one portion of fruit or vegetables if defined as 80grams. In the research, which is published in theInternational Journal of Epidemiology, the team estimate approximately 7.8 million premature deaths worldwide could be potentially prevented every year if people ate 10 portions, or 800 grams, of fruit and vegetables a day. The team also analyzed which types of fruit and vegetables provided the greatest protection against disease. "We wanted to investigate how much fruit and vegetables you need to eat to gain the maximum protection against disease, and premature death, explained Dr. Dagfinn Aune, lead author of the research from the School of Public Health at Imperial. Our results suggest that although five portions of fruit and vegetables is good, 10 a day is even better." The results revealed that even a daily intake of 200 grams was associated with a 16 percent reduced risk of heart disease, an 18 percent reduced risk of stroke, and a 13 percent reduced risk of cardiovascular disease. This amount, which is equivalent to two-and-a-half portions, was also associated with four percent reduced risk in cancer risk, and 15 percent reduction in the risk of premature death. Further benefits were observed with higher intakes. 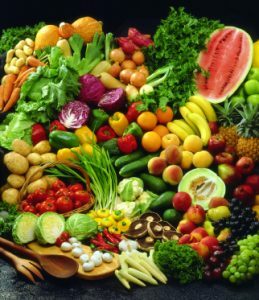 Eating up to 800 grams of fruit and vegetables a day - or 10 portions - was associated with a 24 percent reduced risk of heart disease, a 33 percent reduced risk of stroke, a 28 percent reduced risk of cardiovascular disease, a 13 percent reduced risk of total cancer, and a 31 percent reduction in dying prematurely. This risk was calculated in comparison to not eating any fruit and vegetables. The current United Kingdom guidelines are to eat at least five portions or 400 grams per day. However, fewer than one in three UK adults are thought to meet this target. The team were not able to investigate intakes greater than 800 grams a day, as this was the high end of the range across studies. An 80 gram portion of fruit and vegetables equals approximately one small banana, apple, pear or large mandarin. Three heaped tablespoons of cooked vegetables such as spinach, peas, broccoli or cauliflower count as a portion. The researchers also examined the types of fruit and vegetables that may reduce the risk of specific diseases. They found the following fruits and vegetables may help prevent heart disease, stroke, cardiovascular disease, and early death: apples and pears, citrus fruits, salads and green leafy vegetables such as spinach, lettuce and chicory, and cruciferous vegetables such as broccoli, cabbage and cauliflower. They also found the following may reduce cancer risk: green vegetables, such as spinach or green beans, yellow vegetables, such as peppers and carrots, and cruciferous vegetables. Several potential mechanisms could explain why fruit and vegetables have such profound health benefits. "Fruit and vegetables have been shown to reduce cholesterol levels, blood pressure, and to boost the health of our blood vessels and immune system, Aune said. This may be due to the complex network of nutrients they hold. For instance they contain many antioxidants, which may reduce DNA damage, and lead to a reduction in cancer risk. Compounds called glucosinolates in cruciferous vegetables, such as broccoli, activate enzymes that may help prevent cancer. Furthermore, fruits and vegetables may also have a beneficial effect on the naturally-occurring bacteria in our gut. The vast array of beneficial compounds cannot be easily replicated in a pill. "Most likely it is the whole package of beneficial nutrients you obtain by eating fruits and vegetables that is crucial is health, Aune continued. This is why it is important to eat whole plant foods to get the benefit, instead of taking antioxidant or vitamin supplements, which have not been shown to reduce disease risk." In the analysis, the team took into account other factors, such as a person's weight, smoking, physical activity levels, and overall diet, but still found that fruit and vegetables were beneficial. "We need further research into the effects of specific types of fruits and vegetables and preparation methods of fruit and vegetables, Aune continued. We also need more research on the relationship between fruit and vegetable intake with causes of death other than cancer and cardiovascular disease. However, it is clear from this work that a high intake of fruits and vegetables hold tremendous health benefits, and we should try to increase their intake in our diet." Eating potassium-rich foods like sweet potatoes, avocados, spinach, beans, bananas and even coffee could be key to lowering blood pressure, according toAlicia McDonough, Ph.D., professor of cell and neurobiology at theKeck School of Medicine of the University of Southern California. Decreasing sodium intake is a well-established way to lower blood pressure, McDonough says, but evidence suggests that increasing dietary potassium may have an equally important effect on hypertension. McDonough explored the link between blood pressure and dietary sodium, potassium and the sodium-potassium ratio in a review article published in theAmerican Journal of Physiology Endocrinology and Metabolism. The review looked at population, interventional and molecular mechanism studies that investigated the effects of dietary sodium and potassium on hypertension. She found several population studies demonstrating that higher dietary potassium - estimated from urinary excretion or dietary recall - was associated with lower blood pressure, regardless of sodium intake. Interventional studies with potassium supplementation also suggested that potassium provides a direct benefit. McDonough reviewed recent studies in rodent models to illustrate the mechanisms for potassium benefit. These studies indicated that the body does a balancing act that uses sodium to maintain close control of potassium levels in the blood, which is critical to normal heart, nerve and muscle function. When dietary potassium is high, kidneys excrete more salt and water, which increases potassium excretion, McDonough says. Eating a high potassium diet is like taking a diuretic. Increasing dietary potassium will take a conscious effort, however. Our early ancestors ate primitive diets that were high in fruits, roots, vegetables, beans and grains - all higher in potassium - and very low in sodium. As a result, humans evolved to crave sodium but not potassium. Modern diets, however, have changed drastically since then: processed food companies add salt to satisfy our cravings, and processed foods are usually low in potassium. If you eat a typical Western diet, your sodium intake is high and your potassium intake is low, McDonough says. This significantly increases your chances of developing high blood pressure. When dietary potassium is low, the balancing act uses sodium retention to hold onto the limited potassium, which is like eating a higher sodium diet. How much dietary potassium should we consume? A 2004 Institute of Medicine report recommends that adults consume at least 4.7 grams of potassium per day to lower blood pressure, blunt the effects of dietary sodium and reduce the risks of kidney stones and bone loss. Eating three-fourths of a cup of black beans, for example, will help you achieve almost 50 percent of your daily potassium goal. McDonough recommends developing public policies to increase intake of dietary potassium from plant-based sources. She also advocates adding potassium content to nutrition labels to help raise consumers awareness of economical sources of potassium. In a research article published inPLOS Medicine, Huaidong Du of the University of Oxford, Oxford, United Kingdom and colleagues report that greater consumption of fresh fruit was associated with a lower incidence of diabetes, as well as reduced occurrence of complications in people with diabetes, in a Chinese population. Although the health benefits of diets including fresh fruit and vegetables are well established, the sugar content of fruit has led to uncertainty about associated risks of diabetes and of vascular complications of the disease. Du and colleagues studied nearly 500,000 people participating in the China Kadoorie Biobank over about seven years of follow-up, documenting new cases of diabetes and recording the occurrence of vascular disease and death in people with pre-existing diabetes. The researchers found that people who reported elevated consumption of fresh fruit had a lower associated risk of developing diabetes in comparison with other participants, which corresponds to an estimated 0.2% reduction in the absolute risk of diabetes over five years. In people with diabetes, higher consumption of fresh fruit was associated with a lower risk of mortality, corresponding to an absolute decrease in risk of 1.9% at five years, and with lower risks of microvascular and macrovascular complications.